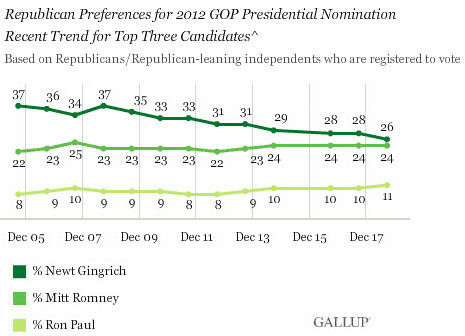 A new Gallup poll shows Newt’s support has declined to the point that he is now basically tied with Romney. The narrowing of the gap between Gingrich and Romney is almost totally a result of Gingrich LOSING support rather than Romney making any gains. Gallup says Gingrich’s former supporters have split among the remaining non-Romney candidates with no single candidate receiving a significantly larger share of Gingrich deserters than any other. Ron Paul is in third place with 11% showing only a slight gain from Newt’s decline. CNN/Opinion Research (see table below) has Newt and Romney now tied at 28% with Paul at 14%.